THE STORY - Famed but tormented artist Vincent van Gogh spends his final years in Arles, France, painting masterworks of the natural world that surrounds him. THE GOOD - A gorgeous avante garde examination of Vincent van Gogh's life and work that explores the complex intersections of creativity, mental health, and internal experiences with its beautiful cinematography and dramatic score. THE BAD - Will have a limited appeal due to it's over the top artistry and dedication to examining the more complex ideas that lie at the heart of creating a work of art. ​​​​​All too often films shoot to reach the widest audience possible, but some aim for a very specific group of people and “At Eternity’s Gate” falls decidedly into the latter category. The life of Vincent van Gogh has been explored in many films, but Julian Schnabel’s most recent effort looks at this complex painter from a new angle, that of an artist. Filmed as a gorgeous and slow-moving fever dream, “At Eternity’s Gate” portrays Vincent van Gogh’s life with a sense of gravitas and intensity that is very successful at communicating his internal struggles. The viewer often sees the world through Vincent’s eyes, and at times it can be exhausting and upsetting. As appropriate in such an artistic endeavor, the most inexplicable moments in Schnabel’s film bring an authenticity that adds a sense of life and despair that is necessary to understand the complexities of the artist at the heart of the film. 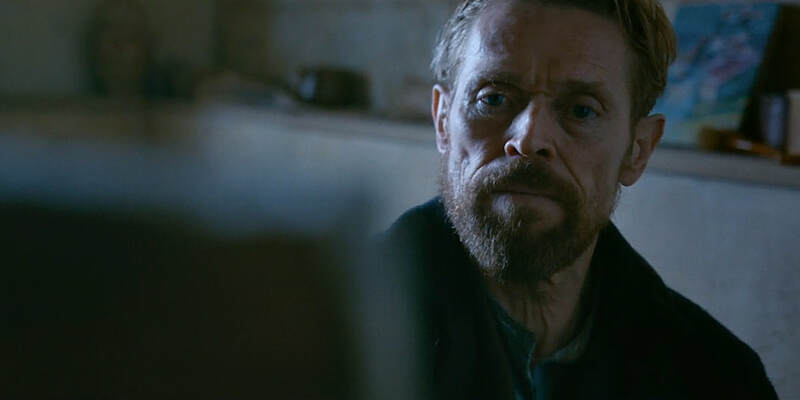 “At Eternity’s Gate” opens in Paris when van Gogh’s (Willem Dafoe) artistic work has stalled, and he is unsure of how he should proceed with his life. He meets a fellow painter, Paul Gauguin (Oscar Isaac) whose intense passion about how paintings should be created inspires Vincent to new heights of artistic ecstasy. On Gauguin’s suggestion, van Gogh moves to a small agricultural town in the south of France, where he finds his art in the glories of nature as he wanders the fields and wilds of the surrounding area. While there he indulges in excessive drink and absinthe and becomes something of a local figure known for his wild outbursts and unpredictable behavior. As he becomes more and more unstable van Gogh’s brother Theo (Rupert Friend) does everything in his power to help Vincent continue with his work, including bringing Gauguin to visit. For a brief period, van Gogh finds happiness and is able to create without the doubt and uncertainty that plague him throughout the rest of his life. But when Gauguin chooses to leave, Vincent descends into a madness that leads him into a cycle of self-destruction that continues until his death only a few years later. “At Eternity’s Gate” is not a straight adaptation from what is known about Vincent van Gogh’s life, instead it is an amalgamation of van Gogh’s correspondence, historical fact and the interpretation by Julien Schnabel of van Gogh’s art that attempts to capture the essence of van Gogh’s creative spirit. While he isn’t the only actor in the film, at times it feels like Willam Defoe overshadows everything else as Vincent van Gogh. His performance is vulnerable, dedicated, and thoroughly invested in making the viewer feel every moment of emotional upheaval that the painter experiences. Oscar Isaac serves as the opposite to the intense and immediate Van Gogh, instead, he is the purposeful and considering Gauguin who doesn’t quite understand the depth of emotions at play within Van Gogh. He plays the character in such a way that his pretention and self-absorbed take center stage and while he gives a good show, we aren’t sad to see him go. Poor Rupert Friend, on the other hand, plays Vincent’s caring and concerned brother with a patience and calm that feels almost too real for those who have experienced these kinds of difficulties with their loved ones. For those who are interested, “At Eternity’s Gate” offers an in-depth examination of the philosophy behind how and why art is created and who should or should not be creating that art. Van Gogh was unknown during his life and due to the popularity of realist paintings, his work was considered ugly and childish when it was being created. The film uses that fact to explore the inherent worth of the individuals’ interpretation of the world and whether those interpretations have value from both the commercial and existential perspectives and allows the viewer to draw their own conclusions. However, Schnabel’s slow and methodical exploration will not engage a lot of viewers and its high-minded ideas are a little too obscure to capture the attention of general audiences no matter how well such concepts are explained. From the handheld camerawork to the severe close-ups and intentionally blurry cinematography it is obvious from the beginning that the film has no intention of being a simple experience and it becomes clear by the end that “At Eternity’s Gate” is meant to be contemplated like a painting. Schnabel uses every option at his disposal to give us a sense of the world through Van Gogh’s eyes not the least of which is the thundering score that is carefully laid over certain scenes to provide a necessary emotional depth that reverberates throughout the film. “At Eternity’s Gate” is an experience that is meant for those who want to contemplate the deeper meaning behind art but for those who are looking for a straightforward examination of Vincent van Gogh’s life, there will be little to endear them to this strange and exploratory film.